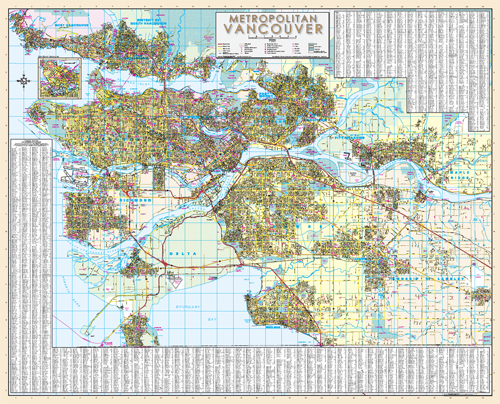 Metropolitan Vancouver Wall Map 43" x 52"
The revised 2015 edition includes over 100 new streets since our last printing including the South Fraser Perimeter Road. It is one of our largest wall maps. It displays in detail all streets and related features for 17 municipalities - North Vancouver, West Vancouver, Vancouver, Burnaby, New Westminster, Richmond, Delta, Surrey, White Rock, Coquitlam, Port Coquitlam, Pitt Meadows, Maple Ridge, Port Moody, Langley, Anmore and Belcarra. Map features include Block Numbers, Parks, Golf Courses and Cemeteries, as well as locations for Schools - Elementary, Secondary and Private, Hospitals, Police Stations, Fire Halls, Libraries, Shopping Centres, Community / Recreation Centres, Points of Interest and Visitor Centres. It is polybagged and shipped in a sturdy mailing tube.